This photograph shows the Atchison, Topeka & Santa Fe Railway Company's Wm B. Strong #2 locomotive. The steam engine was named after the president of the Atchison, Topeka and Santa Fe Railway Company William Barstow Strong. 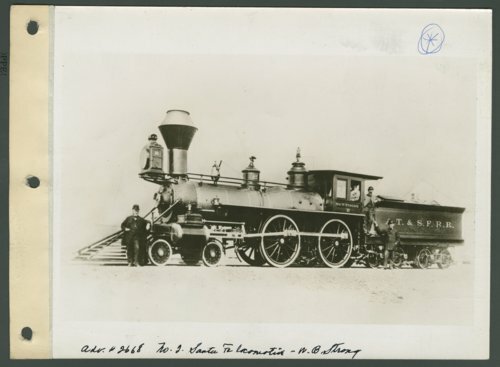 He served from 1881 to 1889 and developed the Santa Fe into a major transcontinental railway company with the expansion of over 7,000 miles of right-of-way.